Samsung is one of the first brands that PC enthusiasts think of when it comes to choosing an SSD, and with good reason. The company might be best known for its appliances and smartphones, but it’s one of the world’s biggest and most important semiconductor manufacturers. Its in-house development and manufacturing capabilities give it a huge advantage when it comes to selling modern SSDs at reasonable prices. Samsung has been at the forefront of SSD technology, and with every move to a denser kind of flash or faster interface, it has had a new model ready. The current Samsung SSD portfolio includes entry-level SATA models and top-tier NVMe performance drives, split into the 8xx and 9xx series respectively. Most recent generations within each series have had one higher-priced Pro model and a more affordable Evo counterpart. This has led to a little redundancy, but Samsung wants to have a tier for everyone. At the very top of the hierarchy is the SSD 970 Pro, which is one of the only SLC (two bits per cell) SSDs left on the market and is thus somewhat of a luxury product now. At over Rs. 46,000 for 1TB, it’s a serious indulgence for people want the highest possible speed and endurance. For most people, the SSD 970 Evo would be the far more sensible choice. It’s only one rung below the SSD 970 Pro and is also much faster than a SATA SSD. It’s rated to withstand even heavy enthusiast use, and priced at around Rs. 32,000 for 1TB. Now, Samsung is inserting the brand new SSD 970 Evo Plus in between those two models. It supersedes the SSD 970 Evo as the most appealing performance choice, and targets the same audience of enthusiasts with updated specs. We’re going to see what’s new, and whether this SSD should now be your first choice. The reason for the introduction of this new model is the availability of Samsung’s new 96-layer vertically stacked MLC NAND flash. The SSD 970 Evo uses the company’s previous-generation 64-layer flash chips. Samsung is also claiming much better performance due to improved firmware and its new flash chips. The rated sequential read speed is the same for both models, at 3,500MBps but the sequential write speed is up from 2,500MBps to an impressive 3,300MBps. Random read and write speeds are also both improved. Samsung claimed 500,000 IOPS and 480,000 IOPS for random reads and writes respectively with the SSD 970 Evo (measured at the ideal queue depth of 32). Those numbers are now up to 620,000 IOPS and 560,000 IOPS respectively with the SSD Evo Plus. That’s really quite a surprising jump. These numbers don’t apply to every capacity variant. As we’ve seen with many other SSDs, controller and PCIe bandwidth are more saturated when there are more physical flash chips that can work in parallel. The 250GB version of the Samsung SSD 970 Evo Plus is rated for 3500MBps sequential reads and 2300MBps sequential writes. Samsung also helpfully publishes more realistic random read and write speeds using a queue depth of 1, and the 250GB model is rated for only up to 17,000 IOPS and 60,000 IOPS respectively. While there’s a huge difference between the speeds that Samsung highlights for marketing and those in its detailed spec sheet, we’re happy to see that they are at least being published so enthusiasts to really know what they’re getting. These speeds are also quite a bit higher than those of the SSD 970 Evo. It should be noted that Samsung’s best-case-scenario sequential write speeds are predicated on the Intelligent TurboWrite feature, which earmarks a portion of the TLC flash as an SLC buffer. Writing only one bit per cell rather than three requires less precision and error correction, and data is later stored away in TLC without you even noticing. The buffer size ranges from 13GB on the 250GB model to 78GB on the 2TB model. Once that is filled up, the sequential write speed of the SSD 970 Evo Plus will drop significantly to 400MBps on the 250GB model, and to 1750MBps on the 2TB model. This shows that there is a huge difference between the capabilities of different capacity units that bear the same model number. When copying a 30GB game folder, for instance, you’ll quickly hit this barrier and see a speed drop on the 250GB model, while the 2TB model shouldn’t even hiccup. Again, Samsung doesn’t hide this information but not everyone will go looking for it. The lower speed threshold is also still significantly faster than what even a SATA SSD can deliver. Writing at the highest speeds requires the files in question to be on an equally capable source device. The only difference other than speeds between the older and newer product lines is improved power efficiency. The 250GB version of the SSD 970 Evo has a rated range of 5.4W to 9W when active, while the SSD 970 Evo Plus is rated at between 5W and 8W. Power consumption when idle and when the host system is at sleep are unchanged, at 30mW and 5mW respectively. Both series will have 250GB, 500GB, 1TB, and 2TB models, although Samsung says that the 2TB version of the SSD 970 Evo Plus will only become available this April. What’s interesting is that all capacities, up to and including the 2TB version, will ship as single-sided M.2 modules. That’s a phenomenal density for a device just barely larger than a stick of chewing gum, and it means that even today’s thinnest and lightest laptops could have up to 2TB of very fast storage. Our 250GB review unit has a 512MB LPDDR4 DRAM cache. It’s the same if you choose the 500GB capacity option, but scales up to 1GB and 2GB respectively for the 1TB and 2TB SSD models. Samsung has used its own Phoenix controller and it isn’t clear if there are generational differences between the one used on the SSD 970 Evo Plus and its predecessor. Samsung also hasn’t stated whether it can (or will) release its improved firmware to the older model to improve performance. You get 256-bit hardware AES encryption for data security. Endurance also scales with drive capacity, from 150TBW for the 250GB model to 1200TBW for the 2TB model. The warranty is five years, unless you hit the TBW limit before that, which is extremely unlikely in any day-to-day situation. For our 250GB review unit, you’d have to write about 82GB every single day, or fill the drive completely every three days, for five years, before you hit that limit. This also hasn’t changed compared to the SSD 970 Evo. For our benchmark and real-world testing, we used the same hardware that we’ve tested a few recent standout SSDs, all of which will be competition to the Samsung SSD 970 Evo Plus. The components of our test rig included an AMD Ryzen 7 2700X CPU, Gigabyte Aorus X470 Gaming 7 Wifi motherboard, 2x8GB of G.skill DDR4 RAM, a 1TB Samsung SSD 860 Evo boot drive, XFX Radeon R9 380X graphics card, and Corsair RM650 power supply. M.2 SSDs are extremely easy to install, as long as you have ready access to the correct slot on your motherboard. If you’re upgrading a fully built system, you might need to temporarily remove your graphics card and be very careful not to lose the one tiny screw that’s needed. We installed our 250GB SSD 970 Evo Plus review unit without any trouble. Windows reported the formatted capacity as 232.88GB. 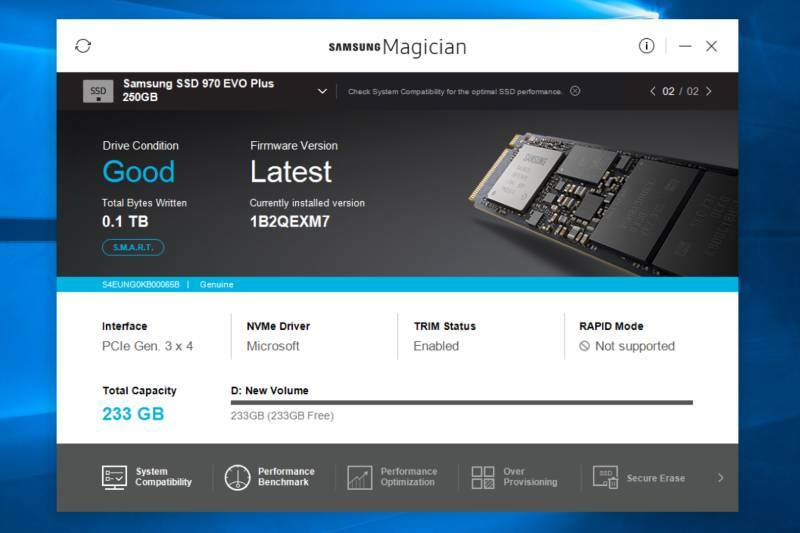 The free Samsung Magician tool, which you can download, shows an overview of drive health and capacity. It lets you quickly update the drive’s firmware or erase it securely. You can also manually set how much space is set aside for overprovisioning. This lets you sacrifice some of your usable capacity to ensure that there’s physically enough spare flash to be used as buffer space while data is being swapped in and out of each flash cell, or to substitute for cells that degrade over time. This will be in addition to the invisible overprovisioned flash that all good SSDs have outside of their advertised capacity. There’s a quick, basic benchmark within the Samsung Magician tool. We ran it and got sequential read and write scores of 3,496MBps and 2,346MBps respectively. Random speeds were 145,507 IOPS and 152,587 IOPS respectively. The tool’s test methodology isn’t explained, but we can see that Samsung’s own software reports numbers that are in line with the rated best-case scenario speeds on the spec sheet. We then turned to CrystalDiskMark, an industry standard performance benchmark. The Samsung SSD 970 Evo Plus got sequential read and write scores of 3558.1MBps and 2382.1MBps; again in the same ballpark. The more realistic random Q8T8 speeds (using queue depth of 8 with 8 threads) were 577.3MBps for reads and 1473.1MBps for writes. For the sake of comparison, the WD Black NVMe SSD (2018) that we reviewed posted similar sequential read speeds but better sequential write speeds. Random reads and writes also favoured the WD drive, particularly random reads by a very large margin. The Corsair Force MP510 lagged slightly in the sequential write test but came out ahead everywhere else, again by large margins. The Anvil benchmark gave the Samsung SSD 970 Evo Plus an overall score of 11,838.84. The individual read and write scores were 5,519.74 and 6,319.99 respectively. With those scores, it comes in behind WD and Corsair’s offerings again. One extremely important thing to note about these comparisons is that we’re testing the 250GB version of the SSD 970 Evo Plus which has relatively low speed ratings, whereas both Corsair and WD sent us high-capacity review units that showed off their models in the best possible light. Our ratings below apply solely to the 250GB unit that we have tested. 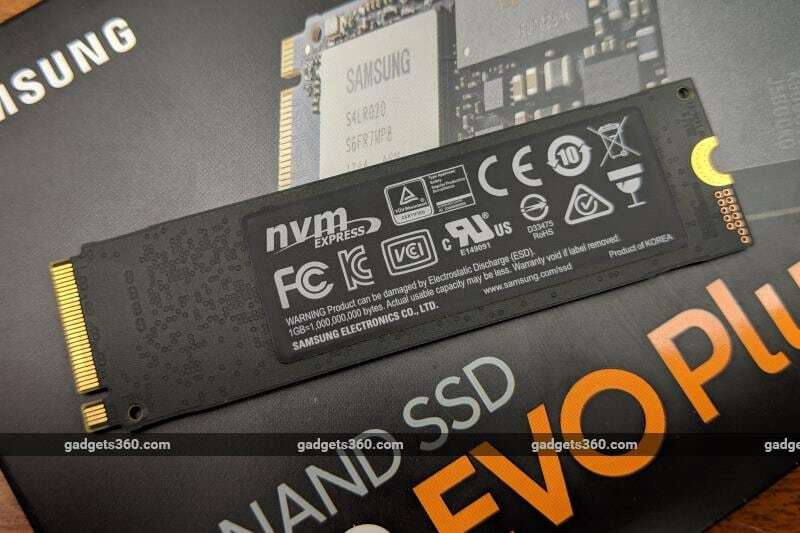 We’re surprised that the Samsung SSD 970 Evo Plus doesn’t beat the competition in terms of raw performance, but it isn’t an apples-to-apples comparison because of the capacity differences between the units each manufacturer sent us. The Samsung SSD 970 Evo Plus does have a lot to offer, and extrapolating a little from our test results, it’s clear that the 1TB and 2TB versions will be more competitive. 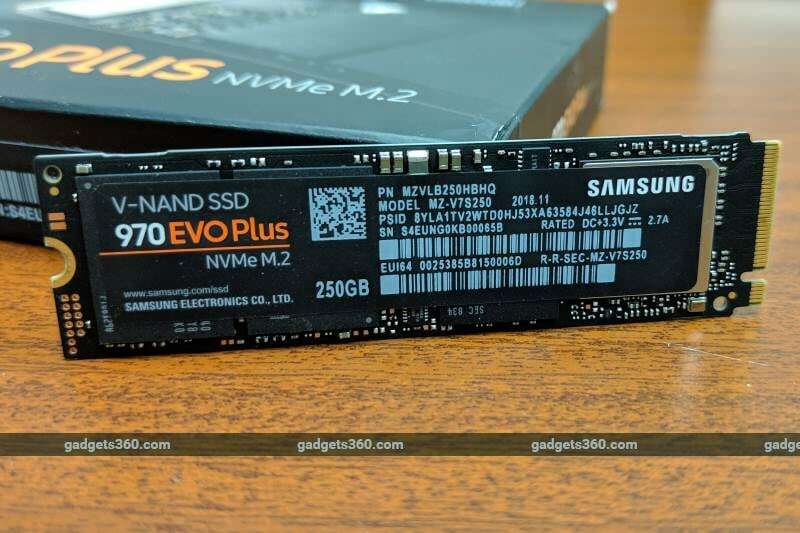 Samsung’s official MRP for the 250GB SSD 970 Evo Plus at the time of launch is Rs. 6,479. The street price will settle much lower, but it’s interesting that this is already lower than the current street price of the equivalent SSD 970 Evo. If you can get by with the performance of a SATA SSD, the Samsung SSD 860 Evo is still an excellent choice at around Rs. 4,750 for 250GB, but entry-level models cost less than Rs. 3,000. What this goes to show is that people on a budget who are looking for a 250GB or 500GB SSD should not go by marketing and promotional statements alone. It might not be worth spending a lot of money on a high-end SSD unless you’re willing to go all the way to the top and pick up a high-capacity option. Based on launch prices, the 250GB model’s value for money doesn’t seem all that great, with the 500GB model costing just under 50 percent more for twice the capacity. If you’re an enthusiast anyway, you’ll be far more satisfied with the faster and roomier models, but that will raise the cost of entry.